The last couple of weeks has been full of activity, social and otherwise. Three family birthdays in under 10 days has meant a lot of running round and family time. Happy Birthday to PattyPie, Sister of Pyjamas and G. May this next year bring you all you hope and wish for. While I may have been absent from posting , I've been busy doing stuff ,patting myself on the back and feeling very virtuous about my crafty achievements. I love that feeling you get when you’re motivated, and it seems like the ability to create might never end. We all know it does but I'm happy to take the feeling for as long as it deigns to stick around. First up, my September sampler blocks for Amanda's chocolate marshmallow sampler have been finished. I'm just using fabrics that appeal to me as these blocks are rolling out - so I'm hoping it'll all come together at the end. Looking at these fabrics, I suspect I might end up with something very different to anything I've ever made before. Last weekend the family got together to celebrate my Mum's birthday with a BBQ (and plenty of resultant silliness) I took my hand sewing planning to make a small hexie project which has now morphed into my Miss Elizabeth quilt. Slow but steady progress has been made this past week and I've sewn enough hexies to make one and a bit rows of of the inner guts of the quilt. I had a sewing day with PattyPie on Friday - No 2 nephew asked me to make a baby quilt for one of his friends so I got a start on that and continued with the quilting on Saturday- it's now awaiting some decorative stitching on the bunting flags and then I can whack the binding on and call it done. Marrakesh is a finished quilt top....which needs a decent press before I start basting it - This thing is huge and its really hard to get a picture of the whole quilt. Needless to say I love it. Those fabrics and layout make my heart sing. And lastly I'm going to leave you with a project my Mother In Law has been working on - her first ever hand sewing project. It's at the basting to the backing stage and I think she's done an amazing job! Wow you have been busy!! Love love love Marrakesh! And a huge "Well Done!" to your MIL, her hexies are gorgeous!! Lots of lovelies in your weeks lately. Love the morocan tiles quilt. And the MIL is doing wonders with that blue and white number. Well done to MIL! Your Moroccan Tiles quilt is very pretty......love the rest of the quilty goodness too. You have been a busy girl! Very impressive amount of work given your busy social schedule. 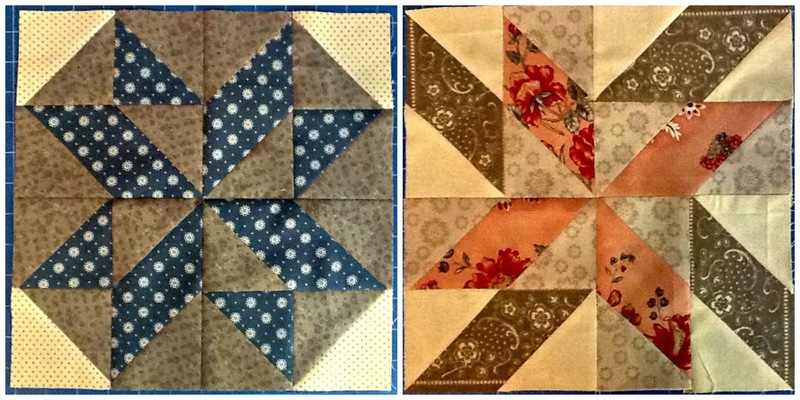 Love the fact you have recruited your MIL into patchwork and what a lovely first quilt she has made! wow you are in a creative space!I love that buzz. I'm liking your Hexis and MIL too! Sounds life is pretty full right now, in a good way. Your sewing mojo is in a roll certainly! Long may it last. Woohoo! 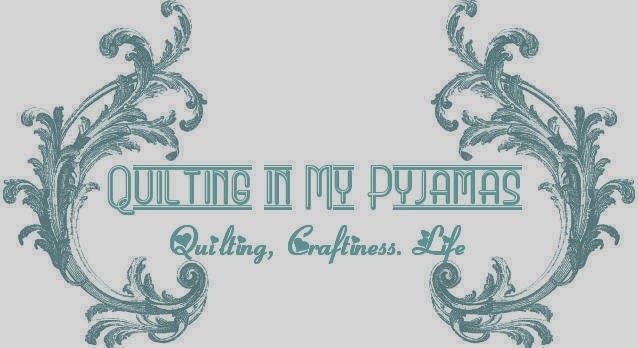 You are in the quilting mode! Love the Marrakesh quilt. That border fabric is perfect. :) Great to see the hexies too. Looks like a very special quilt. Wow, Look at you go!! You've been busy and are very deserving of lots of pats on the back!! Every things looks wonderful. How fun that your MIL sews too. It's a great acheivement to hand piece a quilt top. Hope the mojo lasts, love it when the creativity keeps coming. Your Marrakech is gorgeous, as is MIL hexies. Well look at your churning out the good stuff! Love Marrakesh, its gorgeous! Can't wait to see what you do with the quilting. I wish I had that "patting myself on the back and feeling very virtuous about my crafty achievements"
I do like your Marakesh quilt. Can't believe how you are churning these out. It's a real production line. Well done! You made all those quilts and didn't miss a beat in partying--amazing! All of them are beautiful! You really have the eye for color and design. I especially like how Marrakesh is looking. You have been a busy gal. Making all kinds of beauty. Totally impressed, as always, with your array of pretty things! I love that Marrakesh quilt! (and now I have given myself a little earworm of the old CSNY song..."don't cha know we're riding on the Marrakesh Express...All on boaaaard the traaaain!"). Ahem. A big hand to MIL on her lovely quilt finish too! Love, love, love your Moroccan Tile quilt it is beautiful. You have accomplished a great deal. MIL is doing a bang up job on her quilt as well. And the mojo rolls on! Fantastic energy in all your projects, love Marrakesh, the fabrics are so saturated and pretty. The bunting quilt is really cute! Congrats to your MIL on joining the cult. I wonder how you whack on binding. It sounds quicker than the method I use. Love the bunting quilt...aptly for a baby - bunting. The quilting is amazing, too. Wow! Love the Marakesh top, you have inspired me to think about moving this on to the " to do" list, lots of stuff going on at Chez PJs ...your mojo has really kicked in! Geez, you need time away more often ;o) Marakech is looking fab! Love your Chocolate Marshmallow blocks. I'm still working on my two. You've been real productive, hexies a baby quilt and getting Marrakesh to a finished top. Marrakesh is gorgeous by the way. Hi Shay, thanks for sharing your quilts and your fabulous sense of humour. I also work in a job that involves giving to others all day and having nights when the closest thing to sewing I can manage is watching re-runs of Bonnie Hunter's Quiltcam. You are an inspiration - keep up the great work. Look at all those goodies! You are way too busy girl. November is a busy birthday month in my family...me, my cousin, and two of my granddaughters. All the projects look pretty amazing love the marakesh quilt. I need to do some serious sewing this weekend. Busy, busy! Love Marrakesh and that darling baby quilt! Let's see if Blogger eats the comment this time! !